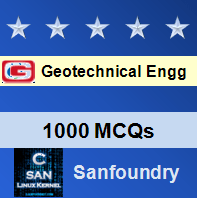 This set of Geotechnical Engineering Multiple Choice Questions & Answers (MCQs) focuses on “The Mohr – Colomb Failure Envelope”. σmax–σmin = f (σmax +σmin) or τmax=f (σn). Explanation: The effect of intermediate principal was studied by D.C. Drucker and W. Prager in 1952, who proposed the concept of a three dimensional yield envelope. Explanation: The major drawback of Mohr criterion is that the curved shape of the envelope, hence the functional form of the equation τmax=F (σn) is not amendable to mathematical computation. Where I1, I2, I3 are the invariant of stress. Explanation: If the auxiliary plane passes through the origin its equation is σ1+σ2+σ3=0 and equation will be σ1+σ2+σ3=constant if the plane is perpendicular to the hydrostatic axis. Explanation: The intersection of yield surface with octahedral plane is called the failure locus. A point on the failure locus represents the stress state at incipient failure. Explanation: Experiments conducted by Cross land in 1965 have demonstrated that a pure state of hydrostatic pressure is unable to produce failure even under enormous pressure. 8. Which of the following equation represent hydrostatic pressure in its purest form? Explanation: According to cross land σ1=σ2=σ3 represent hydrostatic pressure in its purest form. Explanation: The Mohr-Coulomb criterion implicitly assumes that the strength is independent of the intermediate principal stress σ2. Explanation: Since all the points in the auxiliary plane represent deviatorial state of stress, the plane is also called the deviatoric plane.